Copyright 2012 Australian Health Promotion Association. Issues addressed: The presence or absence of amenities in local neighbourhood environments can either promote or restrict access to opportunities to engage in healthy and/or less healthy behaviours. Rurality is thought to constrain access to facilities and services. This study investigated whether the presence and density of environmental amenities related to physical activity and eating behaviours differs between socioeconomically disadvantaged urban and rural areas in Victoria, Australia. 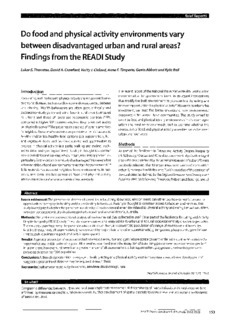 Methods: We undertook cross-sectional analysis of environmental data collected in 2007-08 as part of the Resilience for Eating and Activity Despite Inequality (READI) study. These data were sourced and analysed for 40 urban and 40 rural socioeconomically disadvantaged areas. The variables examined were the presence, raw count, count/km2, and count/'OOO population of a range of environmental amenities (fast-food restaurants, all supermarkets (also separated by major chain and other supermarkets), greengrocers, playgrounds, gyms/leisure centres, public swimming pools and public open spaces). Results: A greater proportion of urban areas had a fast-food restaurant and gym/leisure centre present while more rural areas contained a supermarket and public swimming pool. All amenities examined (with the exception of swimming pools) were more numerous per km2 in urban areas, however rural areas had a greater number of all supermarkets, other supermarkets, playgrounds, swimming pools and public open space per '000 population. Conclusion: Although opportunities to engage in healthy eating and physical activity exist in many rural areas, a lower density per km2 suggests a greater travel distance may be required to reach these.